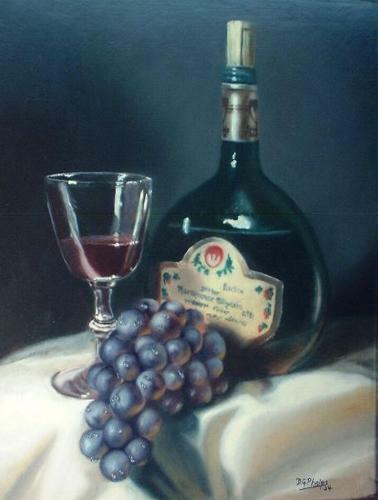 How to Paint Still Life Grapes, Wine bottle, and glass. 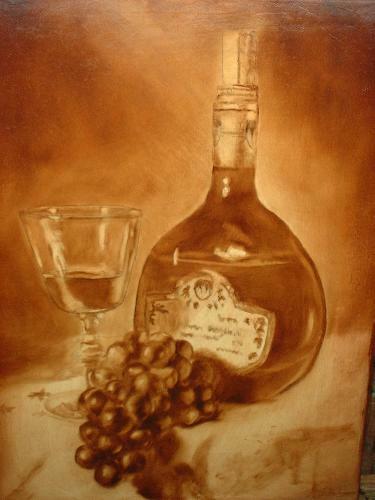 How to paint a Still Life Grapes, Wine bottle and glass painting demonstration. 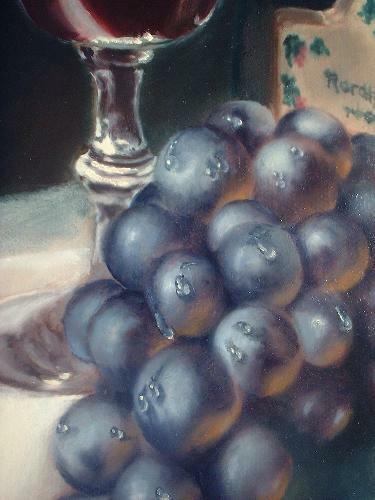 Home > Tips from the Easel > Still life grapes demonstration. 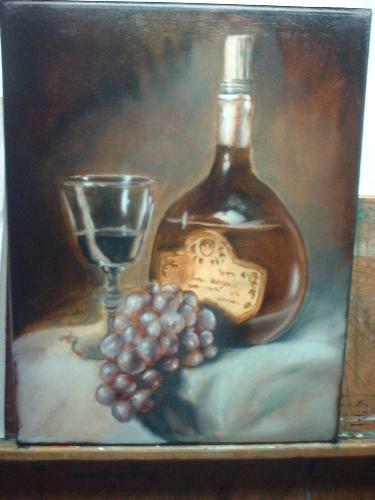 After rummaging around in my hard drive, I found these pics of a still life grapes, wine bottle and glass. 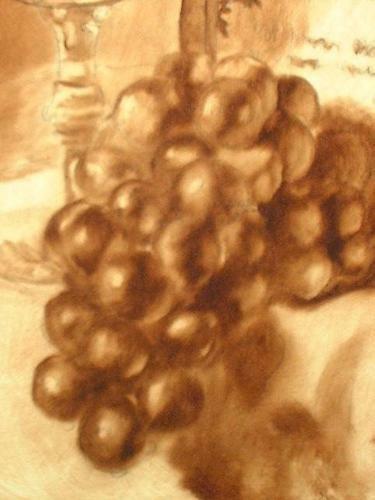 It shows the imprimatura with ink drawing, umber layer, grey layer, and the finishing layer with closeups of the grapes. 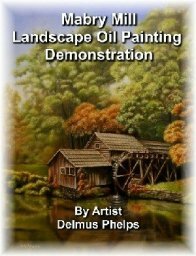 I hope it will be of benefit to you to see the brush work close up. Even at this early stage, I've included the major highlights on the glass. The wine bottle labeling are only hieroglyphics. But from a short distance, they look real! Highlights on the grapes are also included early. This is a small 9" x 12" painting. The completed painting! The gold trim on the label being very shiny and with all metallic surfaces, has a lot of reflections and bright then dark areas. Its amazing what you can do with this technique. 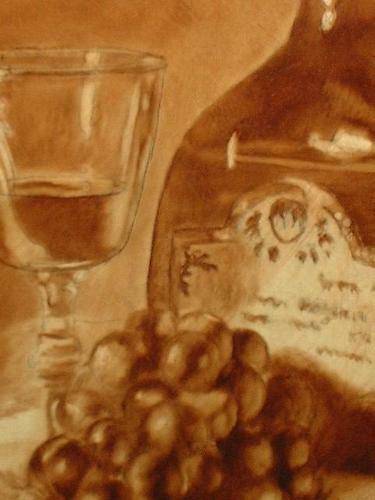 The foil on the wine bottle contains only 3 colors, burnt umber, black and white. Yet, it looks just like foil! Another thing I would like to point out. Within the folds of the cloth, you can see a large amount of the shadows are really only the brown under-painting showing through. It gives the cloth a warm undertone and feeling leaving it there. It represents the candle glow (secondary light source that I discuss in my 1st E-book) on the right side of all objects. 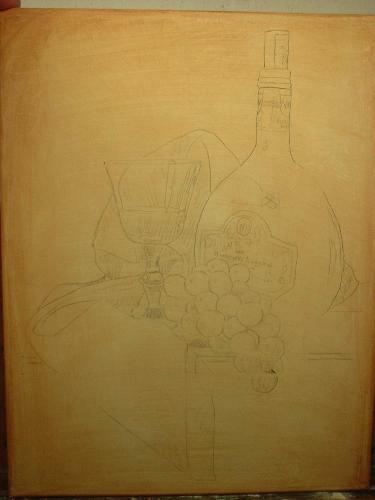 I was unable to locate any of the color layers as they were built up that would have shown the grapes process. I will include these in my next grape painting. 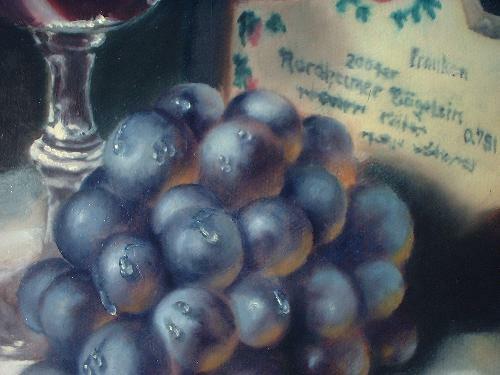 However, you can enjoy some of the close ups of the grapes and glass that show the highlights, gray film on the grapes, and fire glow reflections on the right of each grape.